Who The Hell Is Woody Kincaid? 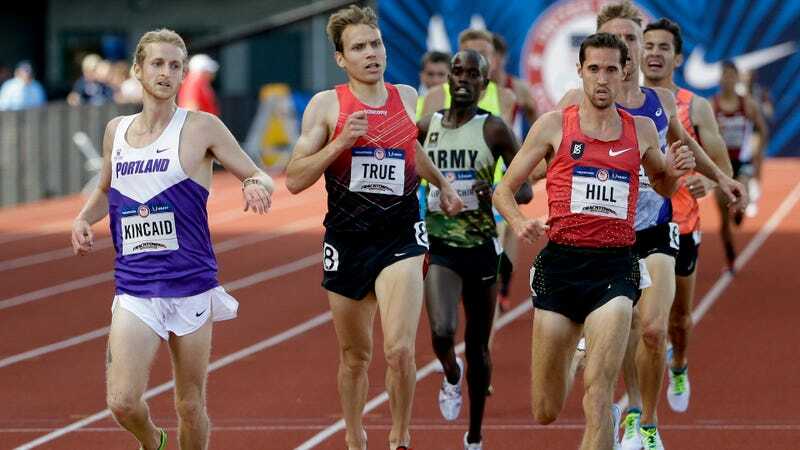 Wiping sweat and spit from his face with his t-shirt, 23-year-old Woody Kincaid seemed to be trying hard not to sound arrogant, or stupid, or insulted by reporters’ surprise at his come-from-behind victory in a semifinal heat of last year’s Olympic Trials 5000 meters. In the final 300 meters, the capacity crowd at the University of Oregon’s Hayward Field witnessed a dude rocking a University of Portland singlet go from tenth to first, passing well-known horses—Bernard Lagat, Ryan Hill, Ben True, Sam Chelanga—along the way. The last of Kincaid’s 12-and-a-half laps was accomplished in a withering 53.7 seconds, the fastest finish of any of the 24 Olympic hopefuls at that distance. “I thought I was going to close hard. So I did. ‘Cause it’s the last lap…” and he trailed off. He was essentially justifying Who the hell is Woody Kincaid? which, like natural talent, is difficult to articulate. William Kincaid—who from his earliest memory has gone by Woody—grew up in Littleton, Colo., and attended Columbine High School. Yes, that Columbine High School, but he was in kindergarten at the time of the shooting, and is quick to defend the Denver suburb, explaining that it is a great place with lots to do, and nice people. He spent a fair amount of time skateboarding as a kid, and he played soccer and gaelic football. No clearly defined life path presented itself, but Kincaid was not without ambition—he had a job at the King Soopers grocery store at 15. Despite winning the Colorado state cross country title his senior year, the phone did not ring. No one recruited him. He planned on attending Metro State University in Denver, or maybe a D-II school. Maybe Wyoming. On Reyes’s suggestion he ran the post-season Footlocker cross country race, where he placed fourth in the Midwest regional race, and 11th at the National Championship. Overnight, Kincaid said, five D-I programs rang him up. One of those was University of Portland. Over the course of 30 years, Rob Conner—called RC by his runners—has built the Portland track and cross country program into a distance running force. The University of Oregon, a hundred miles to the south, skims the obvious crème de la crème, but Conner has developed a pretty successful system—he recruits “under-trained” high school kids and allows lots of room for personal variation and quirkiness in training. Which, naturally, led him to Kincaid. But as Conner knows all too well, talent is only part of the equation. Kincaid is described as quirky and spontaneous—a free spirit who loved being part of the Pilots’ team, both at practice and with extracurricular activities. Conner, who has himself been accused of being quirky, found those characteristics a little troubling. Kincaid went to practice every day and did all the workouts, but he got by on talent and admits he was not all in. This, in contrast to the older, wiser model of running regimentation, Kincaid’s freshman year roommate: Scott Fauble. Then there’s Kincaid’s kick. It’s sounds like boasting (which is unusual in the still, cerebral waters of distance running) when an unknown, heel-striking, perma-pale guy from the University of Portland, for God’s sake, says he can close with anyone. But it isn’t boasting, it’s an established fact. Neither Conner nor Kincaid can pinpoint where that ability came from. His training was interrupted by frequent injuries, making it even easier for his focus to dissipate. Conner’s patience was tested for three years. Kincaid locates the turning point in his attitude in his final cross country season, 2014, when—returning from injury—he used his famous kick to move up dramatically, helping the Portland Pilots to third place in the national championship, their highest-ever finish. Kincaid was a changed man finishing out his senior year, fully committed to becoming a professional runner, while simultaneously segueing into a fast-track MBA with a heavy academic load. Of course, neither the media nor his competition was apprised of his fresh determination. The 2015 NCAA Championships 5000-meter was supposed to be a showdown between Oregon teammates Edward Cheserek and Eric Jenkins. But Kincaid, who was in the lead pack at the bell, surged to the front. “Tactics have never been his strong suit,” Conner said dryly, reasoning Kincaid should have waited to unleash the kick. He finished fifth. When a Portland teammate announced he was going to Kenya to train over the summer, Kincaid “thought about it for a couple seconds” and asked to come along. For seven weeks in the summer of 2015, he lived la vida Kenya—water being the only thing that wasn’t running. For a person intent on pursuing pro running, two goals figured large on Kincaid’s 2016 agenda—attracting the attention of a training group and securing professional sponsorship, which often go hand-in-hand. A good way to do both is to comport oneself well at the Olympic Trials, but 15 days beforehand, Kincaid still had not run fast enough to qualify for the 5000. A downside of sit-and-kick strategy is that, while it may win races, it doesn’t usually result in a fast time. “It was ridiculous, the worst thing he could have done,” Conner said finally. “As far as entertainment, if you like watching two dumb guys, I guess it was okay. Two weeks before the Trials, Kincaid clocked a personal record of 13:27, good enough to earn him a spot on the starting line, but two seconds off the time needed to actually go to Rio. Incidentally, the headlines were not that he’d set a new PR nor that he’d qualified for the Trials, but rather that master closer Galen Rupp had been outkicked by some guy named Woody. Most of the 24 entrants in the Trials field had already achieved the 13:25 Olympic time standard, so theirs was a race for place—first, second, or third—irrespective of time. More than likely the semi- and final of the 5000 would be slow sit-and-kick affairs, which would normally play to Kincaid’s strengths. But he needed to both run the fastest 5000 of his life by two seconds and finish in the top three if he wanted to realize Rio dreams. “And I did just kinda want to go to Rio,” Kincaid said, a thought so far-fetched he didn’t really discuss it with Conner, who was still coaching him. “RC thought there was no chance I was going to get the time standard to go to Rio, so we talked about sitting and kicking for the win,” Kincaid said, figuring a high finishing place would at least open doors with a good training group. Perfectly to script, in the July 4 semifinal, he hung toward the back of the pack of 12, until about 200 meters to go, before cutting the noose and letting it loose. To be clear, he may have been the only one in the field actually trying to win the semi—most of the others were only doing what they deemed necessary to move on to the final, held five days later. The twelve finalists in the men’s 5000 took off at 5:20 pm, jogging. The tight pack started slow and got slower, one lap, two laps, eliciting laughter and muttering in the stands. The best in the country were running a high school pace to save themselves for what would inevitably be a barn-burning last lap. Strategically smart, but from a fan perspective it’s boring, and a little cheap. Two-and-a-half laps into the 12-and-a-half lap race, Brian Schrader, another lesser known youngster who lacked the Olympic time standard, popped out, took off, and immediately gapped the pack. Kincaid went with him. Hayward Field erupted. Two dudes going for it. Damn the torpedoes and sell my clothes, it was a glorious sight. Of course, there were still 10 long laps left. Galen Rupp, whose 5K best was something like 30 seconds faster than Kincaid’s, was the first to reel the two crowd heroes in on his lone quest. Inexorably, the main pack too caught them, swallowed, and spit Schrader out the back. But Kincaid clung gamely on, clipping into their momentum. While two unknowns pulling an upset would have made a beautiful story, the race followed the predicted script, the big winner being 41-year-old Bernard Lagat, who posted an atomic 52-second last lap. To his enormous credit, Kincaid finished eighth, only four seconds out of first. When I mentioned how exciting Kincaid’s race had been to Conner, how crowd-pleasing and bold, there was a long silence. I wondered if the call had dropped. Kincaid said he and Conner, who are still quite close—geographically, in Portland—and as friends, don’t talk about that race because “that Olympic Trials nearly killed RC.” And Kincaid agrees, going for broke, especially after 1000 meters had passed so slowly, was “foolish,” but he doesn’t regret it. Not completely, anyway. There is a happy ending to this story, as Kincaid has realized his original goals of getting into a pro training group and securing professional sponsorship. Partly because of his “ambitious but dumb” running in the Olympic Trials final, he joined Bowerman Track Club, a Nike-sponsored group based in Portland, with some of the best 5000-meter runners in the country. “Boy, that was easier than I thought,” Kincaid said of his prime landing spot. In the nine months since, Kincaid has lowered his 5000 PR from 13:27 to 13:12, and subsequently spends less time answering the question: Who the hell is Woody Kincaid? Can Ghirmay Ghebreslassie Upend The Conventional Wisdom Of Pro Marathoning?